Here’s one of many 5 STAR Reviews our book has received. My cup runnith over. where you can read more reviews and order the book. Oh yes, please bring the book with you when you come for a “check us out in person trip” if you’d like me to autograph it for you. Who knows, someday I may ‘really’ be famous. I just finished reading Sid’s book for the 2nd time. I’ve had a complimentary telephone consultation with him, so I feel like we’re old friends . The 1st time I read it was on the plane on my way down for my one and only exploratory visit. I pretty much knew I would be relocating there unless everything I’d read was exaggerated or false. Unfortunately, when I got there (the week of Thanksgiving 2013), Sid was back in the US for the holiday. I was on my own. All of the information I got from this book and others was all I had to go on. Thank goodness for all the great information. I was able to navigate successfully from beginning to end. I even enjoyed several “Negra Modelos”, a musical concert in the Plaza, a late night comedy revue, and a lot of delicious food! I met several great people and very friendly animals. I received 1st rate service from Jorge Torres and a couple of other rental specialists. Most importantly to me, I was able to determine the community that best suited my needs. Being back in the Mid-Atlantic US for the past 3 months of ” the winter from hell” cemented my decision. After combing through multiple web listings as often as possible, I finally found a house to rent. This is what triggered me to re-read the book. From a real estate point of view, I feel well-armed with the information I need for a smooth transaction. 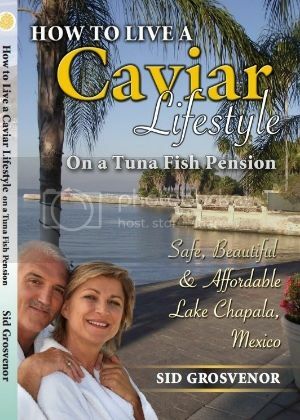 Thanks for the Caviar! Thanks for reading. Looking forward to helping you too!